There is a small but growing body of research and writing on the life, times, mission and accomplishments of the Augustinian mission to Kent in 596-7. 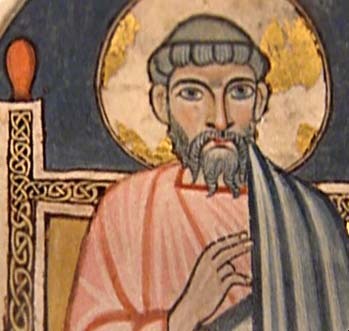 Even so, little attention has been devoted to Augustine the person, the leadership he exercised in the mission to the Anglo-Saxon people, or the spirituality that energised the enterprise. Most studies of Augustine have left Pope Gregory’s missionary to Kent too deeply obscured by his shadow for Augustine’s own leadership to be clearly seen. The main aim is to bring Augustine’s own leadership out from under Gregory’s shadow, and to make his life and legacy more widely known. By the time of the launch of Augustine’s mission in 596, Rome itself had been under siege several times within the sixth century. Blockades, destruction, depopulation, and particularly famine were commonplace throughout Gregory’s lifetime. Gregory’s leadership gifts and skills were considerable. The family had a long association with the Roman Church; Felix III (pope 483-492) was Gregory’s great-great grandfather. Gregory’s father Gordianus had been a senior official of the Roman Church. Much of Gregory’s writings on leadership and the Church are directed towards reintroducing the practice of humble, Christ-like service. Unlike Augustine of Hippo, Gregory had no hope of his world’s regeneration: it was doomed. Mission in these last days was a Gospel imperative, and Gregory intended to honour it. Only three years before launching the English mission Gregory anguished over the deteriorating situation in Rome: Gregory was able to define a reality that had not yet taken shape, and chose Augustine to carry his vision through. There was a need to expand the Roman Church in the face of increasing conflict with the Eastern Church throughout the Mediterranean region. Mission and the pastoral ministry, in Gregory’s understanding, formed an indissoluble unity. Gregory records that the English themselves eagerly desired the mission. Essentially this meant the royal household of Kent, under King Aethelbert and Queen Bertha. However Gregory’s claim that the Anglo-Saxons ‘worshipped sticks and stones’ considerably underplays the cultural achievements of Anglo-Saxon society in this period, as artifacts of jewellery, bowls, clasps indicate. The Frankish bishops, according to Gregory, showed no inclination to provide support for a mission to Kent. It seems that Gregory knew of a Christian presence in the Kentish royal court prior to Augustine’s journey through Gaul. Very little is known of Augustine’s biography prior to AD 596. Legend has it that was a Sicilian by birth who took the name of Augustine after St Augustine of Hippo. Gregory brought him to St Andrew’s monastery in Rome. When Gregory entrusted the mission to Augustine he was far from an unknown quantity in terms of his competence in practical as well as spiritual matters. St Andrew’s monastery now became intimately involved in mission. It seems likely that the Augustine’s party left Rome in June or July 596. If, as the Northumbrian church believed, Gregory had nurtured plans for a mission to England for some years, the details of its implementation are noticeably absent. Up to this point, despite Gregory’s long-held vision for a mission, there is little evidence that the Pope made careful and thoughtful preparations for the needs of the mission en route to Anglo-Saxon England. Augustine’s companions learned of the fierce reputation of the Anglo-Saxon warriors. Fearing for their lives, they requested that Augustine return to Rome and ask Pope Gregory to abandon the mission. Augustine returned to Rome, but the Pope was adamant that the mission should continue. However, once alerted to their needs, Gregory took a number of decisive steps. Augustine returned with a string of letters addressed to bishops and civil dignities on their route requesting their support. To strengthen Augustine’s leadership position, Gregory also made him their abbot with corresponding absolute authority over the group. Augustine’s group travelled by ship from the port of Rome to Lerins in southern France. It was from here that Augustine returned to Rome to elicit further support from Pope Gregory. On his return, Augustine’s journey took the monks through the once-independent kingdom of the Burgundians. As the geographical distribution of Gregory’s correspondence reflects, the cooperation of Frankish rulers beyond Burgundy was now needed to secure a safe passage for the mission. From Lyon, Augustine pressed on to Chalon-sur-Saone and Pope Gregory’s most significant ally, the dowager Queen of Austrasia and Burgundy. With Queen Brunhild’s support secured, Augustine pressed on to Autun and west to Tours on the Loire. Queen Bertha, the Frankish princess and wife of the Kentish king Ethelbert, had close family connections with Tours. Augustine received significant support from the church in France, including 20 priests to act as translators for the missionaries. From Tours, Augustine’s partyfollowed one of the Roman roads north via Paris, to the ancient port of Quentovic (modern Etaples), south of Boulogne. Gregory undoubtedly seized the opportunity that the re-launch of Augustine’s mission afforded to strengthen papal ties and influence with Frankish Gaul. Gregory both urged every support for the mission, but also respect for the temporal powers and property of the Church. Augustine left Rome on the first occasion as monk, on the second as prior or abbot, and finally arrived in England as a bishop. He was almost certainly consecrated as bishop in Arles. This reflects Gregory’s growing understanding of the challenges facing the mission both in Gaul and in England. Bede records that Augustine’s mission, now comprising forty monks and priests, landed on the Isle of Thanet. A chapel was later dedicated to Augustine within the walls of the fort, lending weight to Richborough as Augustine’s landing place. Augustine’s party, strengthened by the addition of Frankish interpreters to assist in preaching to the Anglo-Saxons, prepared to meet the Kentish king. We do not know whether Ethelbert, at the time of their meeting, associated Augustine with Queen Bertha’s Christian faith. Bede records that Augustine, on stepping on dry land, knelt with his party and sang a litany of repentance. For a mission as under-resourced as Augustine’s, the king’s material support was essential. Augustine entered Canterbury with considerable formal authority to accomplish his mission. The missionaries lived and preached from outside the city walls, based at St. Martins Church, already a usable Christian structure, and the centre of at least a small community of believers even before Augustine’s arrival. Bertha played a key part in establishing the new mission, acting as interpreter between Augustine and the king. For an Anglo-Saxon king conversion directly affected culture, tradition, family and power politics, and not only personal faith. For Augustine, the importance of the king’s conversion was absolutely paramount, and his key strategic goal. After a year on the move, one of the first priorities for Augustine’s monks was a place to live and worship from which to launch the English mission. Both abbey and cathedral communities were under Augustine’s direction. Christ Church Cathedral was consecrated in June 602 or 603. At Canterbury Augustine found himself amongst a diverse grouping of other Christians – Queen Bertha, her entourage and her Frankish bishop, Augustine’s own accompanying Frankish clergy, and any surviving community of British Christians. Their religious practices differed from Augustine’s own, and formed the subject of his letter to Gregory in 601. As Augustine was to discover with the British bishops, there were tensions between a continental model of the Christian Church, organised on a territorial basis with bishops superintending dioceses and bearing the authority of their office, and a British model, which was monastic and charismatic in emphasis. In the eight years that Augustine served as bishop in Canterbury, the new ‘diocese’ in Canterbury was a mere geographical expression. If Augustine’s approach to mission was entirely framed by his formation as a monk. In answer to Augustine’s seventh question, how should he relate to the Frankish and British bishops? In reality, of course, authority could not be ‘given’ to Augustine over another autonomous church without willing consent. Realistically, the British Church and their military rulers, who had their own contacts with Constantinople and the Mediterranean world, had little to gain by submitting to Augustine’s – and Rome’s – oversight. The leadership exercised by Augustine in his role as monk, and the crucial lead in mission taken by the monasteries, offer us a way back to a future through the development of alternative expressions of church and community, working within and alongside historic structures in the mission of the Church in our own time.